Habitat: Riparian. This plant grows in moist, shady areas along streams in the desert, uplands, and mountains. It is usually found growing in wetlands (about 67% to 99% of the time), but it is sometimes found in non-wetlands. 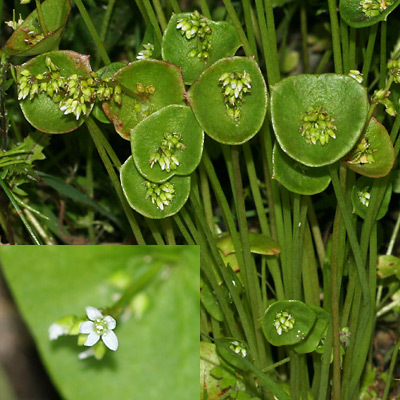 Description: The tiny, 5-petaled flowers are in small racemes at the center of round, perfoliate leaves (stemless leaves that clasp and surround the stems). The leaves are green and fleshy. Stressed plants may have red, orange, or yellow leaves. Unlike the round, perfoliate leaves, the lower leaves are elongated in shape and have petioles. 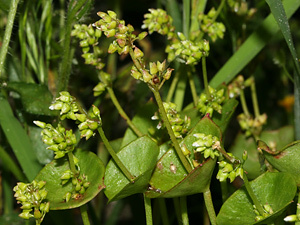 Edible – The young leaves are edible either raw or cooked. The older leaves or the leaves from drought-stressed plants may be bitter. The flowers and flower stalks are also edible.